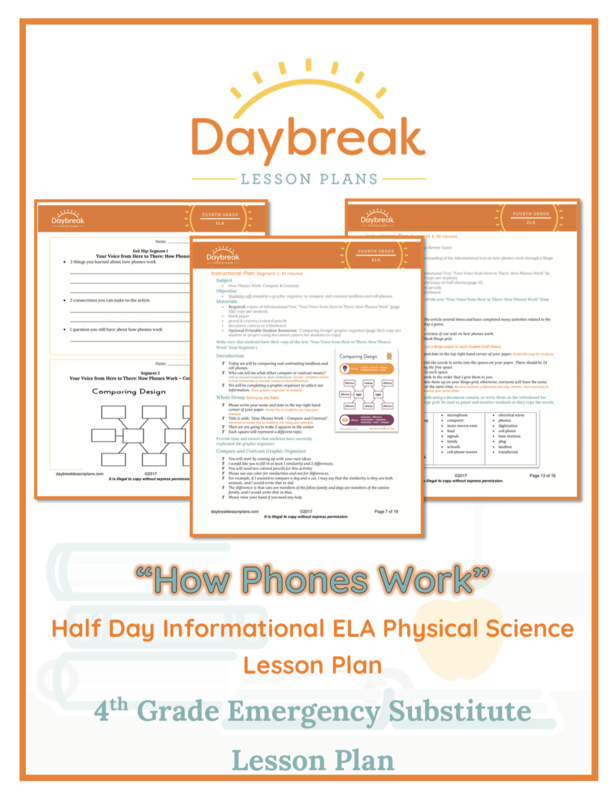 Description: This half day lesson plan is broken down into 4 separate segments (45-60 minutes each) addressing several ELA standards using printable Informational Text: “Bounce! 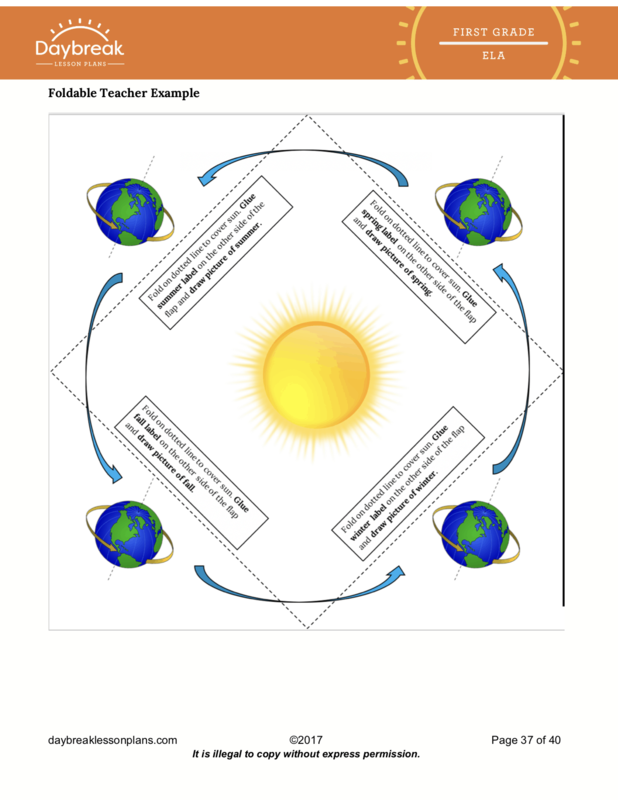 Roll! 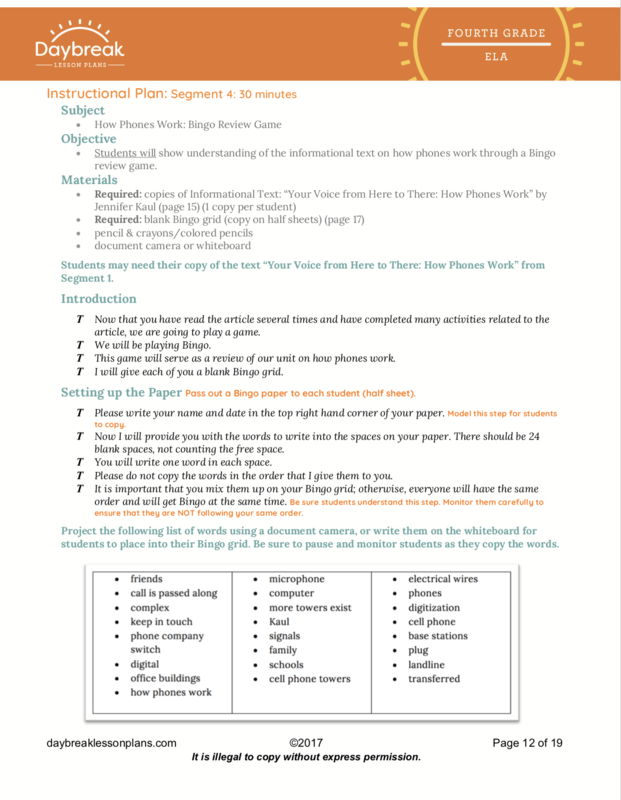 Slide! 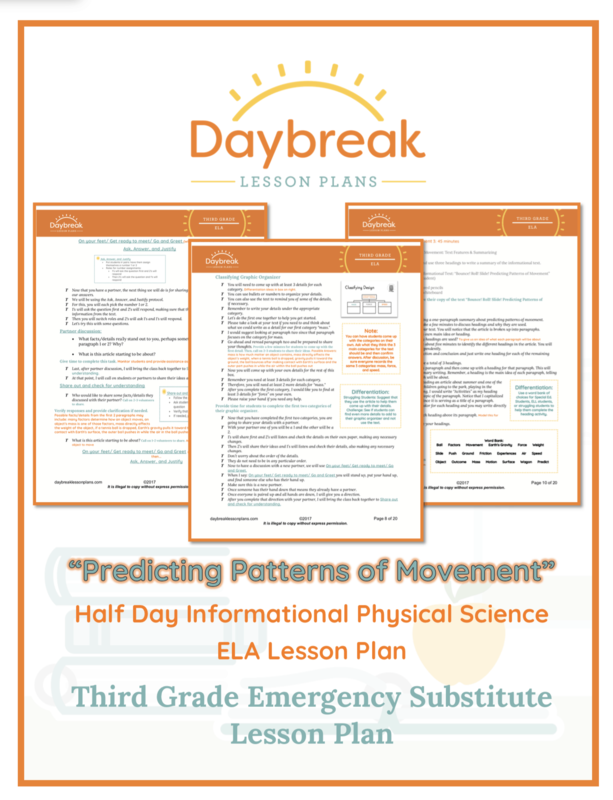 Predicting Patterns of Movement” by Jennifer Kaul. 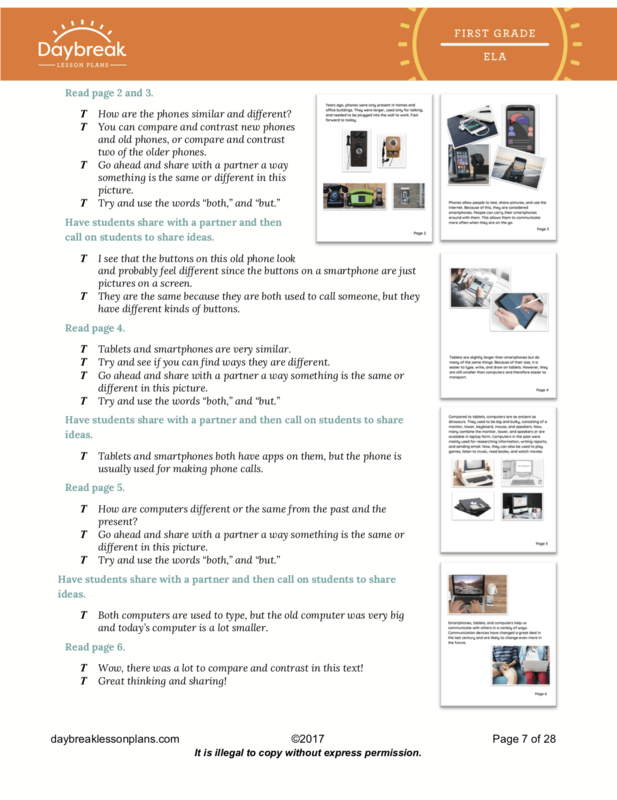 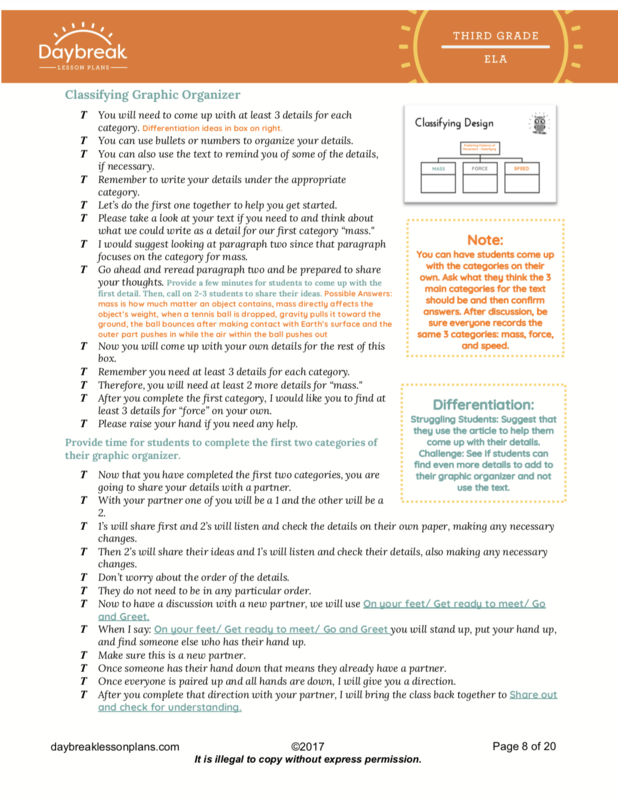 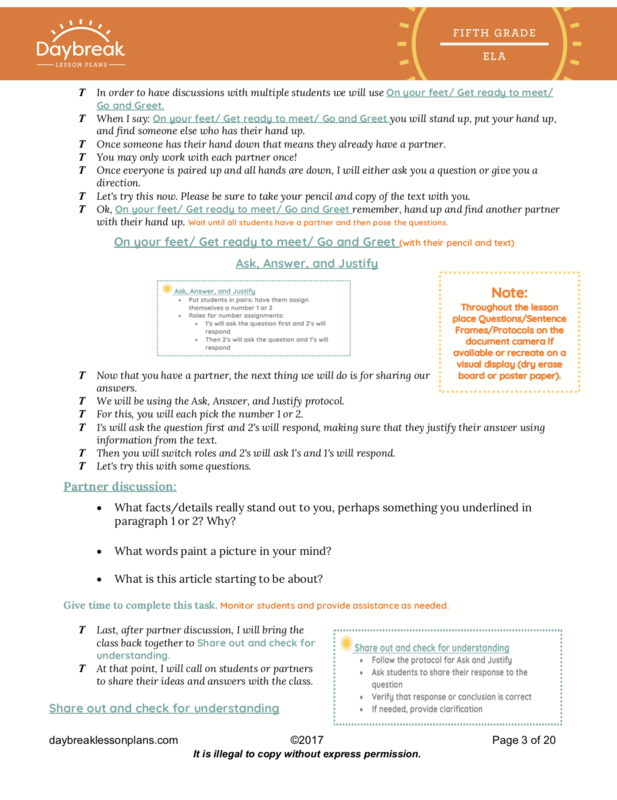 Your students will use close reading comprehension techniques (RI.3.1-3.4, 3.6, 3.8). 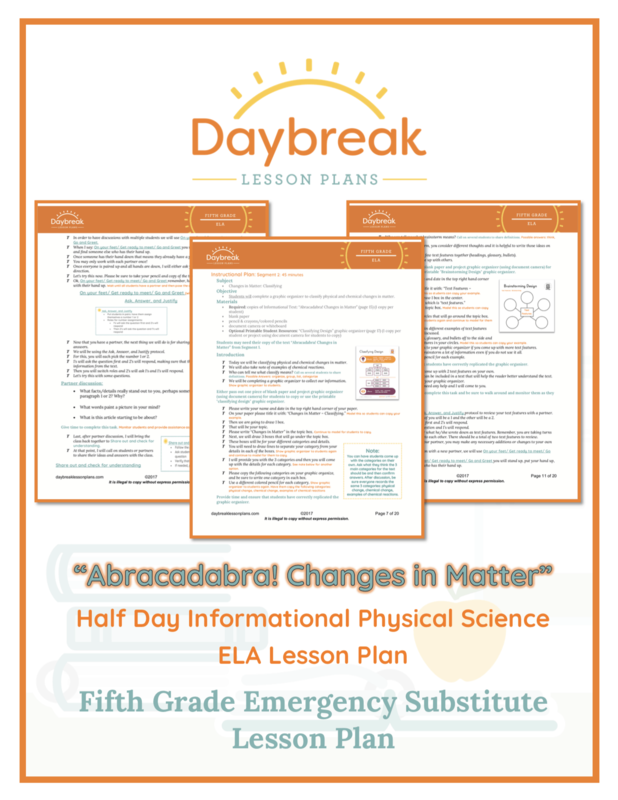 Description: This half day lesson plan is broken down into 3 separate segments (45-60 minutes each) addressing several ELA standards using the printable text “Abracadabra! 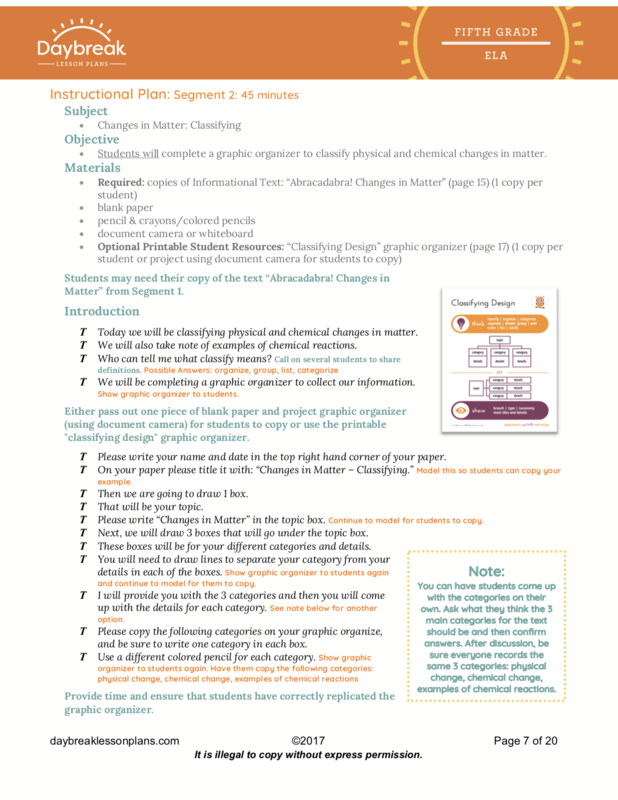 Changes in Matter” by Jennifer Kaul. 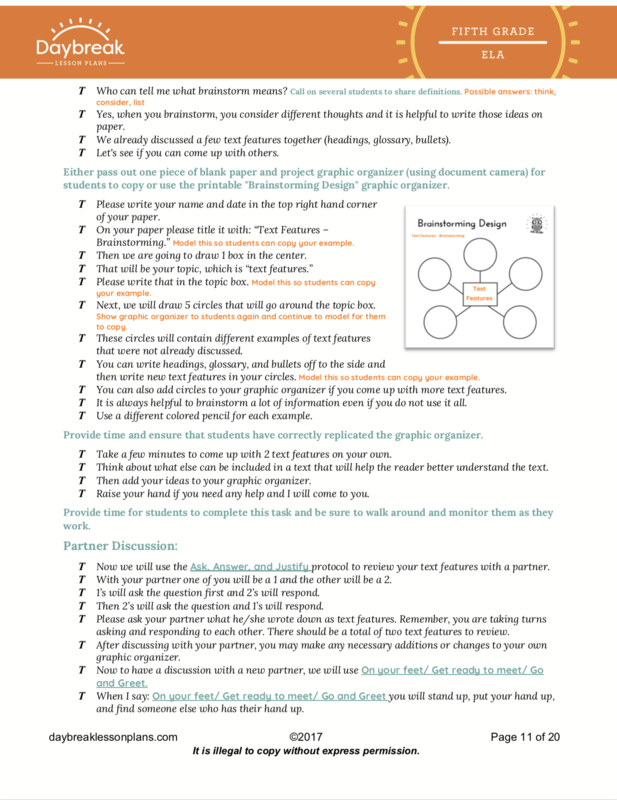 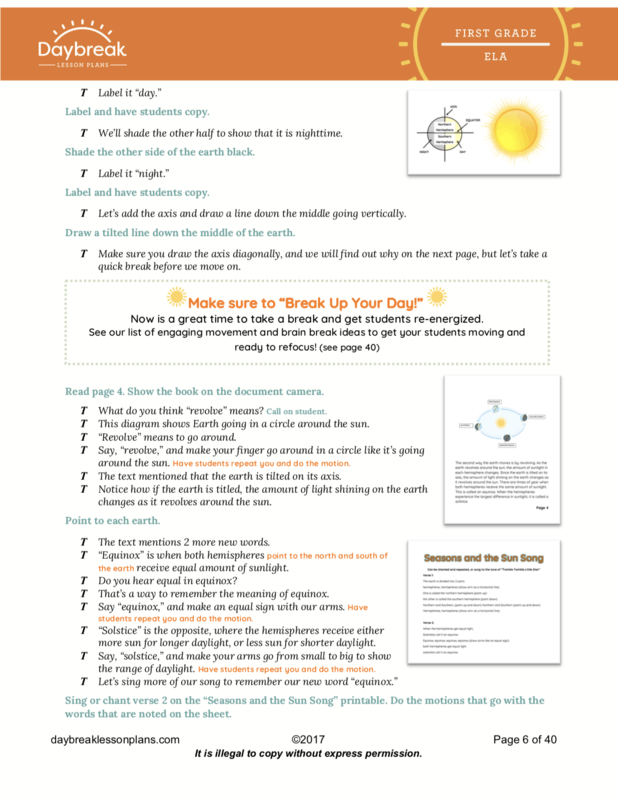 Your students will use close reading comprehension techniques to practice synthesizing, key details, vocabulary, classifying, and text features (RI.5.1-5.4, 5.6-5.8). 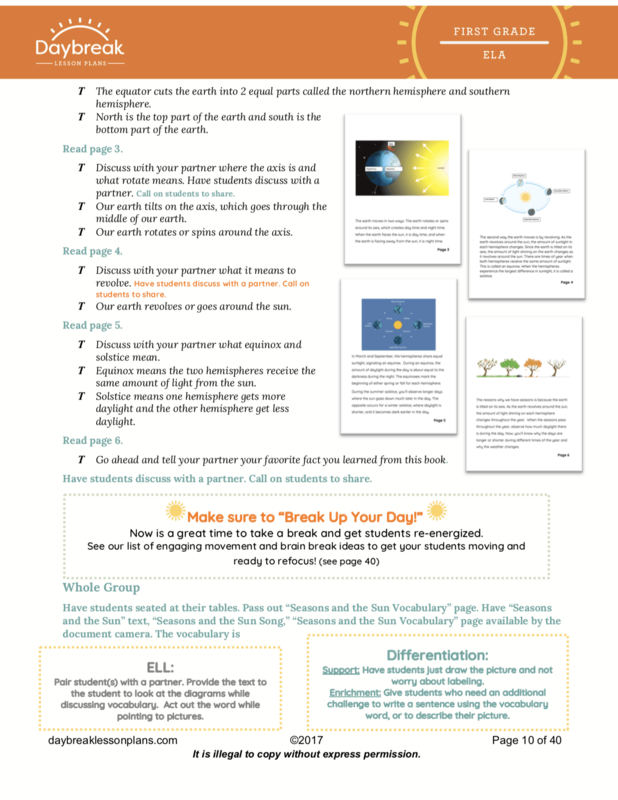 Description: In this half day Informational Text ELA lesson related to NGSS 1.PS (divided into 3 segments), 1st graders will read complex text and answer text-dependent questions in order to identify the main idea and key details, compare and contrast information in the text, classify/sort different devices based on different time periods and have the opportunity to create their own communication device. 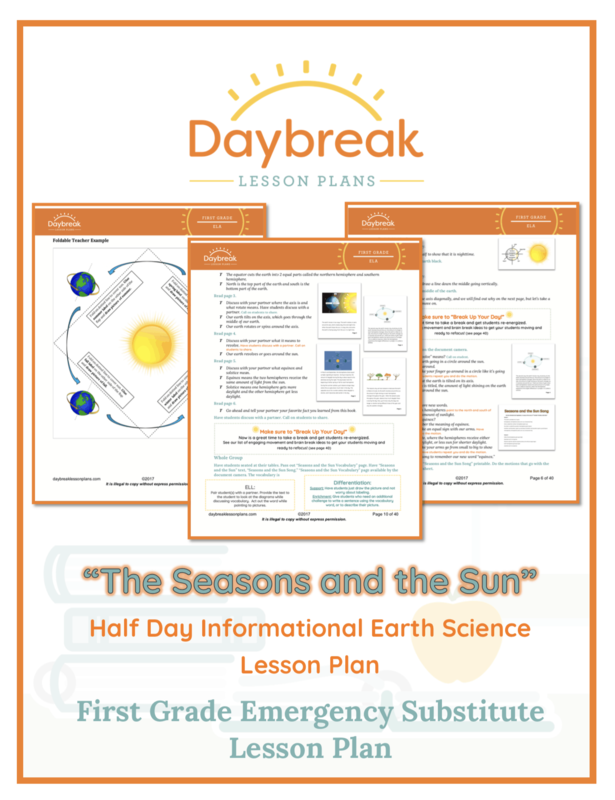 Description: Fourth Grade half day of ELA lesson plans containing 4 independent lessons based around a physical science Informational Text. 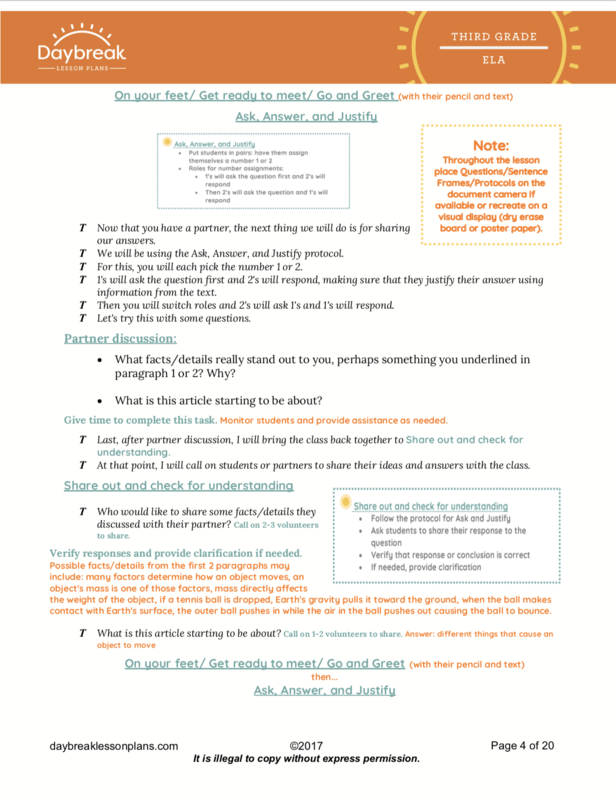 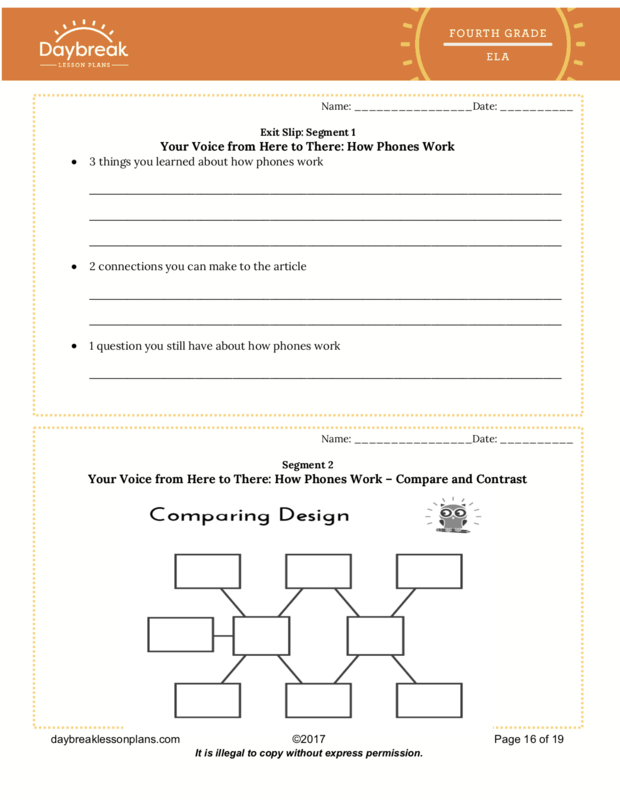 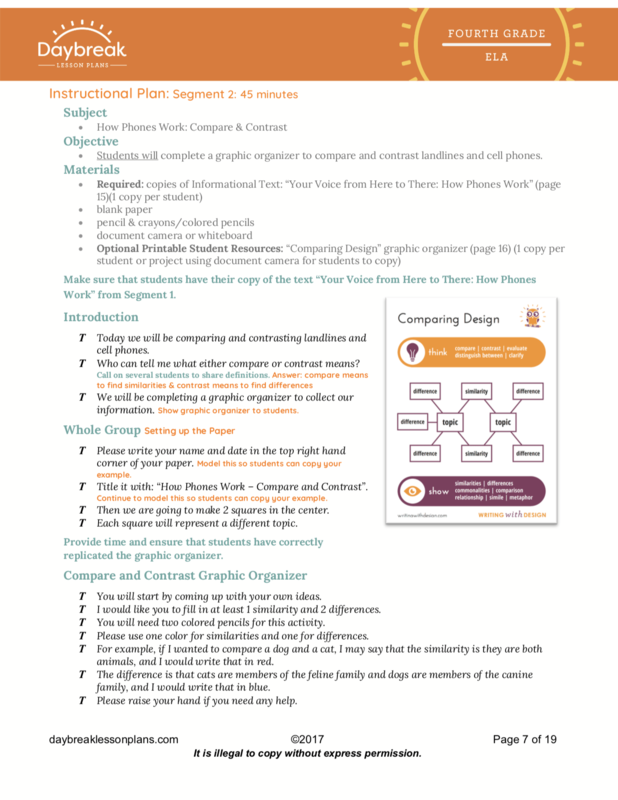 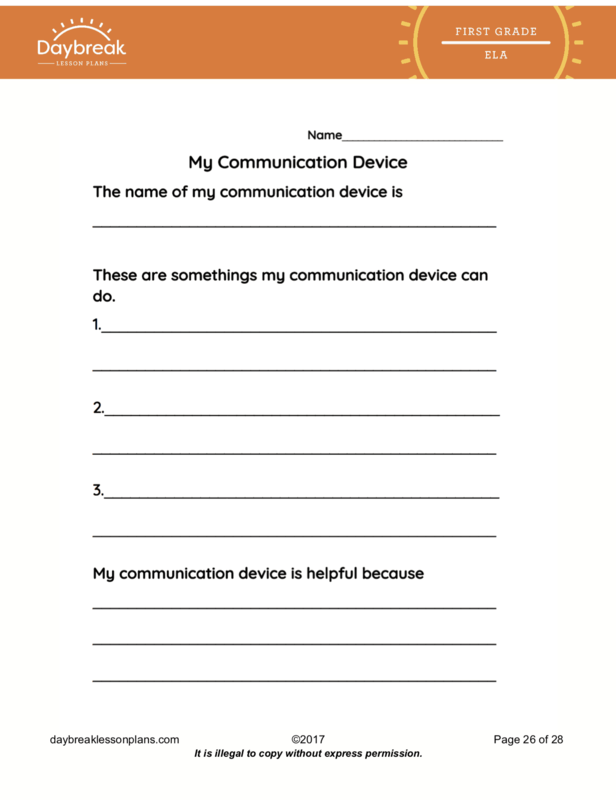 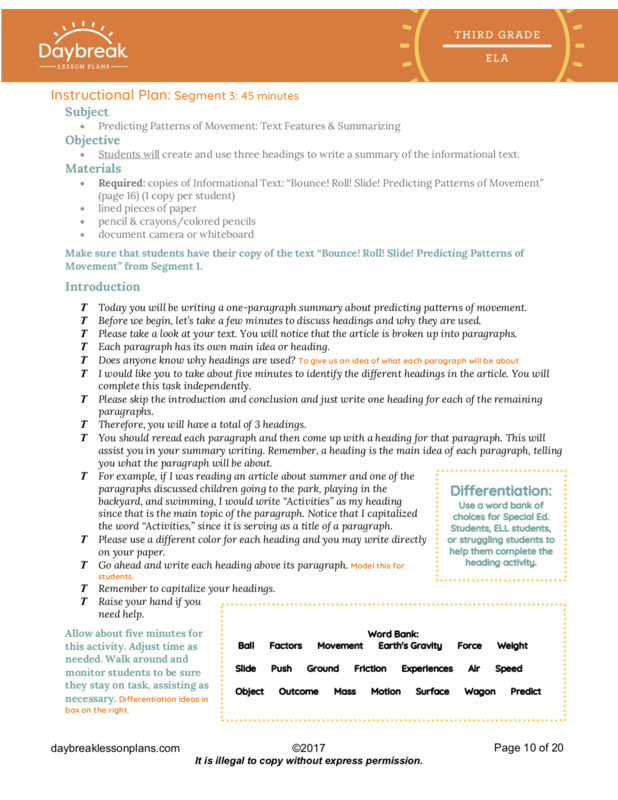 These lessons include: close reading comprehension techniques (RI.4.1-4.6, 4.8), identify key details and vocabulary, comparing and contrasting activity, creating headings for an informational text, writing a summary, and Bingo review game to show understanding of the text. 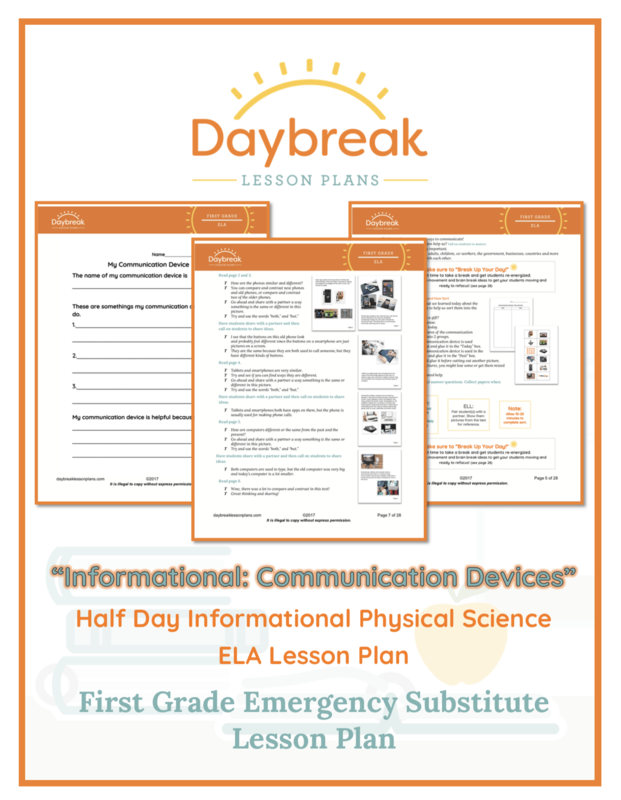 Description: Kindergarten half day of ELA lesson plans containing 3 separate segments (45 minutes each) addressing reading and writing comprehension standards. 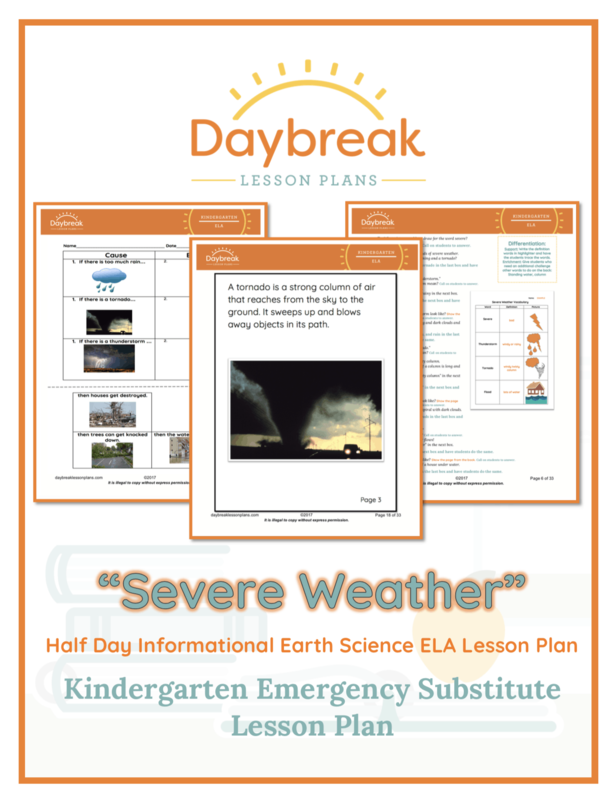 These lessons include a read aloud of an informational text on the earth science topic of severe weather. 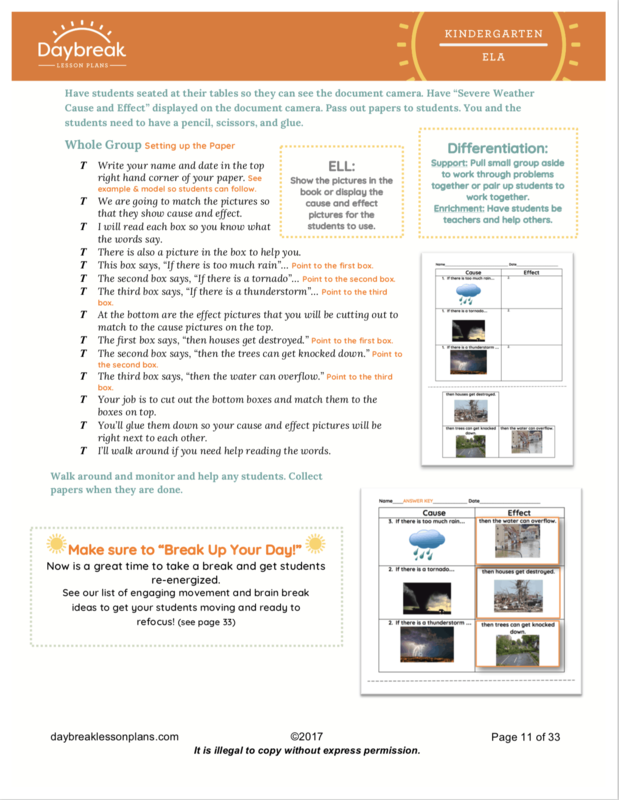 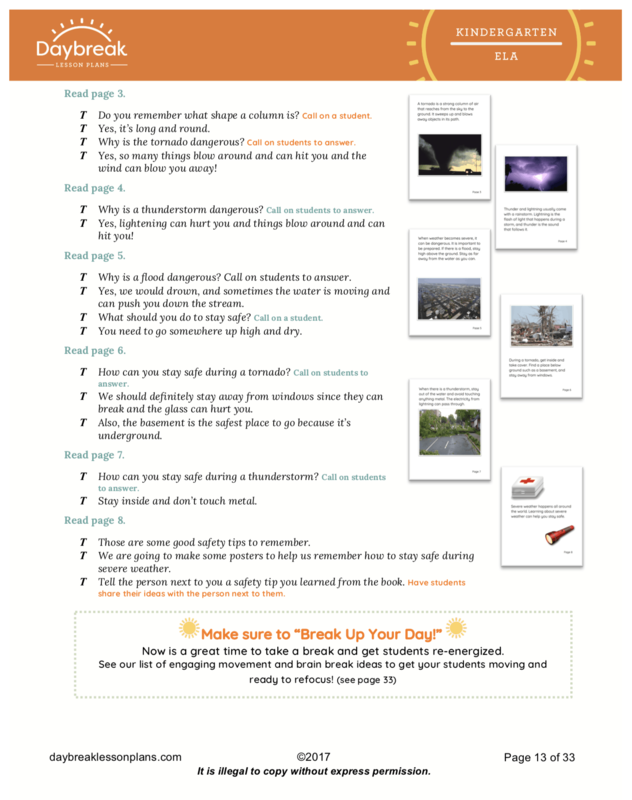 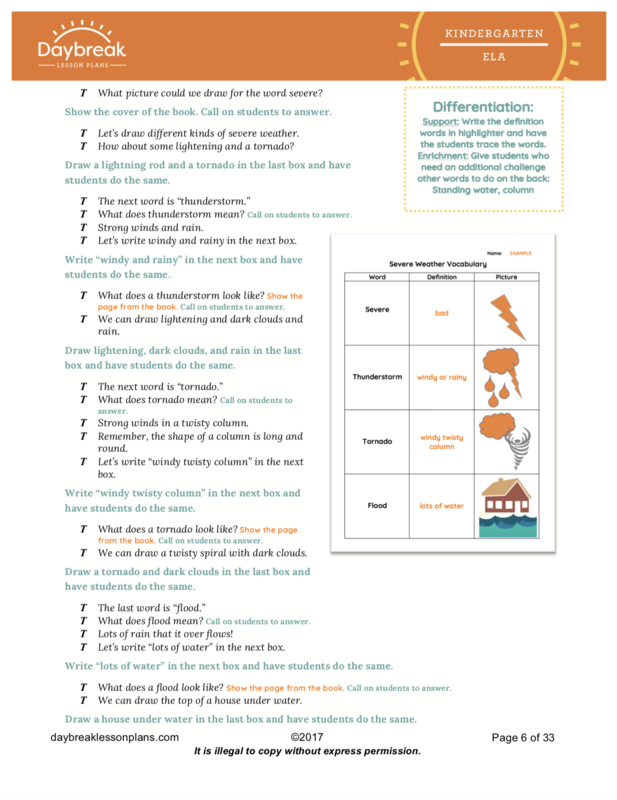 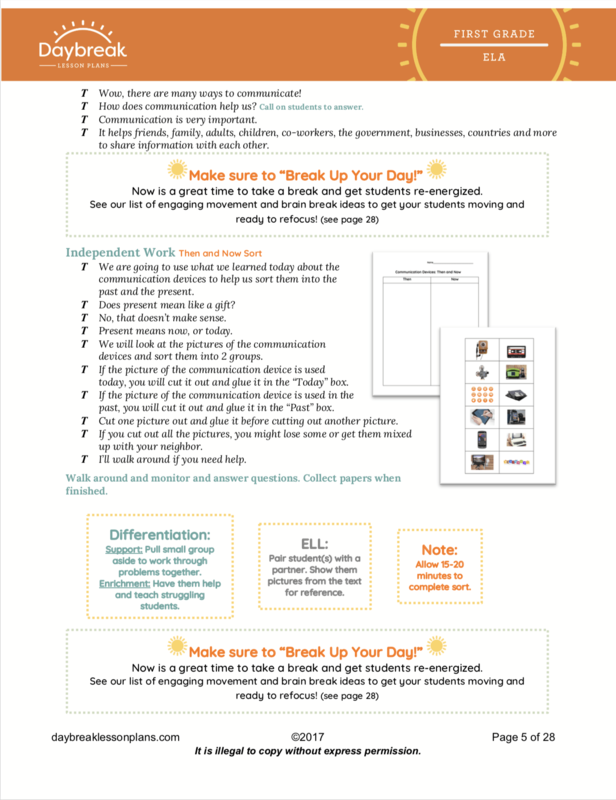 Use the printable text, "Severe Weather" by Jennifer Kaul, to help students practice identifying parts of a nonfiction text, defining new vocabulary using context clues, asking and answering question, cause and effect, and creating a poster to show understanding of ways to stay safe.